Helping children is the primary mission of Kars4Kids. That’s why we created a small grants program for helping worthy organizations that share our mission. And it’s why we’ve awarded a small grant to the Hibiscus Children’s Center, where abused and neglected children can find a warm, safe, and loving place to heal. Join us in congratulating Hibiscus Children’s Center and read about how Hibiscus is helping children in this frank interview with Tracy Savoia, Marketing Director for the Hibiscus Children’s Center. K4K: How did Hibiscus Children’s Center come into being? Was there an event that jolted the founder, LaVaughn Tilton into action? LaVaughn was catapulted into action by the news of the senseless and tragic death of a toddler at the hands of his own father. LaVaughn and her family launched a campaign across the Treasure Coast that galvanized the community to stand up for abused children and ensure they had a safe place to temporarily call home. Her quest to create what would become the Treasure Coast’s only licensed emergency shelter for abused children, ages birth to 12, inspired builders, contractors and local citizens to embrace this vision of a safe haven for children. With the building’s construction funded by private donations of property, materials, services and funds, Hibiscus Children’s Shelter in Jensen Beach opened its doors in October, 1989, with twelve beds. K4K: How many years has Hibiscus Children’s Center been in operation? Have you served many children? Tracy Savoia: The Center was founded in 1985, which means we are celebrating 30 years of helping children. Hibiscus Children’s Center has served thousands of abused, abandoned and neglected children over three decades and that translates to 250,000 safe nights. K4K: Tell me about your volunteers. Tracy Savoia: We have over 300 incredible volunteers that help in our thrift shop; mentor and tutor children; cook meals; read to children; paint and help with maintenance items; fundraise and advocate in the community for our children; and much more. Volunteers come from all walks of life. Some come to Hibiscus due to personal past experiences and some just want to invest in children’s lives. All volunteers are trained and matched with their areas of interest. Volunteers must have a up-to-date background check to work with the children. K4K: How many children are currently under the care of Hibiscus Children’s Center? What are some of the services you provide them? Tracy Savoia: Currently, we house 75 children in our residential facilities in Martin and Indian River Counties. These are abused children and youth—birth to 18 years of age—who have been removed from their homes by the State. Hibiscus provides shelter, food, clothing, medical and educational services and therapeutic services by our professionally trained mental health services staff. Children and youth enjoy recreational and educational outings while there are opportunities for career preparation provided to our teens. Most importantly, the children and youth are loved, cared for and know they are valuable and important to us. K4K: Tell us about the kind of situations you’re dealing with at Hibiscus Center. Tracy Savoia: In our over three decades of operation, we have seen and heard incredibly tragic stories of abuse that children have endured. Abuse can be physical, sexual, mental, neglect and/or abandonment. All of these types of abuse leave deep emotional wounds, even when the physical scars have healed. There have been many success stories as well—children who walked in to our shelter terrified and abused, but after love and care from the staff and volunteers, the healing process begins. It may just be a smile; doing well in school; behaving appropriately; all of these are small successes for our children. We are excited when children receive loving new homes after their parents’ rights have been terminated. A new future awaits them in a loving and safe home; and several times, we have witnessed sibling groups adopted together. K4K: Do you ever receive the same children as repeat residents at Hibiscus Children’s Center? Can parents who abuse or neglect their children be rehabilitated? Whose responsibility is it to determine whether it is safe for a child to return home? Alexis’ story shows how community support can dramatically improve quality of life for a youth. When Alexis was 5 years-old, she came to the Hibiscus Children’s Shelter as a scared young girl who had no idea who was going to take care of her or if she would ever see her family again. Over the years, Alexis spent time at the Shelter and in several foster homes. Not having a stable home or permanent family resulted in behavioral issues in school as well as displays of anger towards those around her. A few years after leaving Hibiscus, Alexis returned as a teenager and was placed in the Hibiscus Village in Vero Beach. She was a defiant and angry 15 year-old girl. The years of moving from foster home to foster home and the difficult circumstances of her family had taken their toll on her. But the Village staff never gave up on Alexis. They persisted in helping her realize her value and the potential for a better future. With time, Alexia began to formulate goals and envision the life she wanted. Alexis focused on schoolwork and threw herself into softball and several other activities. The young girl’s determination toward getting her life in order was evident in her resilience and in her willingness to work hard in school and with her mental health therapist. The therapist provided Alexis with tools to handle her anger and hurt in appropriate ways. She was a young lady who had experienced so many obstacles and disappointments at the hands of those who should have provided love and safety for her, but she was fighting her way back. Alexis participated in the Hibiscus Career Pathways to Independence Program which assists teens in preparing for the future through career training and preparation. Working closely with the program coordinator, Alexis developed the life skills, career knowledge and resources she needed to succeed. On turning 18, Alexis was ready to leave the Village, now equipped to lead n independent and productive life. A terrific job opportunity led Alexis to move from Vero Beach, but the young lady has kept in touch with the Village staff and is a mentor to a teen currently living at the Village. Tracy Savoia: Yes, many children have been placed in our residential facilities multiple times. It is the responsibility of the State to determine if a child should be removed, where he or she will be placed and if the child can be returned home.The State also orders any treatment deemed necessary for the parents. 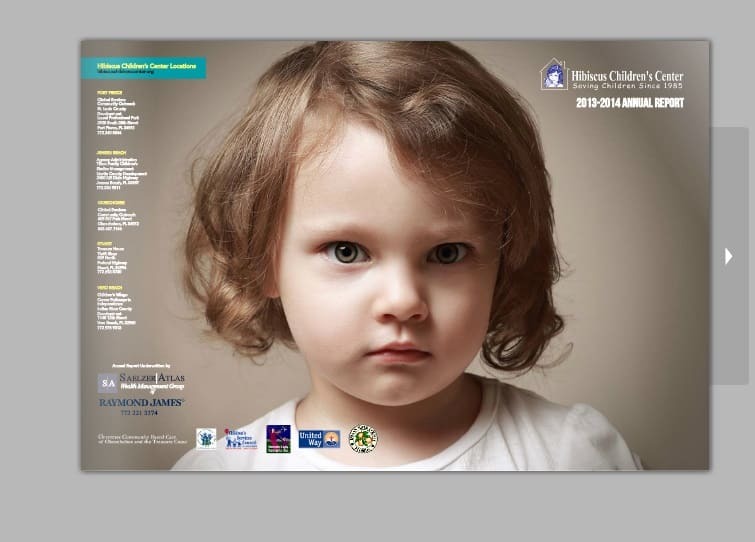 K4K: Are abuse and neglect of children specific to low-income families? Tracy Savoia: Abuse and neglect do not have socio-economic boundaries. Such issues occurs in all walks of life, economic levels, and status. However, the added stress of financial burdens can sometimes manifest in child abuse and/or neglect. Hibiscus has a prevention program in St. Lucie County that addresses these issues with families on a voluntary basis to help the family through a crisis and help to keep their children safe. K4K: Do you ever have children who beg to stay at Hibiscus Children’s Center when it is time for them to return home or go to a foster home? Tracy Savoia: Yes! Many children and youth have said that Hibiscus is the first place they have felt truly safe. They also have many positive opportunities they did not experience at home. K4K: What is the ultimate goal of Hibiscus Children’s Center? What do you see as its future? Tracy Savoia: The ultimate goal and mission of Hibiscus Children’s Center is to save and protect children’s lives. Through our many programs—prevention, intervention, recovery, and residential facilities—we strive to do this every day. Hibiscus Children’s Center has a strong foundation that has been built on 30 years of support and dedication to our mission. Our future is strong and we will continue to grow and change to provide the critical services our children and families need.